Discover Andalusia and its three sparkling jewels – Seville, Cordoba, and Granada from Madrid on an unforgettable journey. 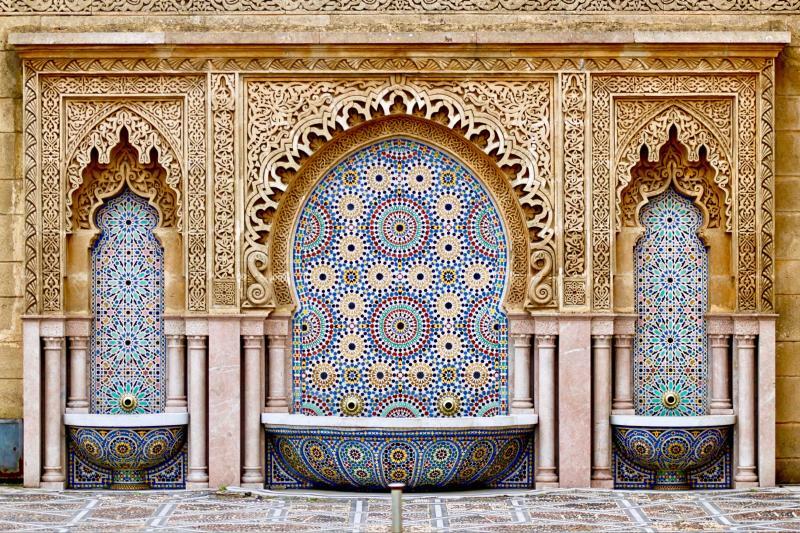 From Southern Spain, travel to Morocco and witness its unique architecture, vivid colours and medinas. You’ll discover the mesmerizing treasures of Marrakesh, Casablanca, Rabat, Tangier and more! Departure from a central location in Madrid at 8.30 a.m. to La Mancha, the land of Don Quixote. Transport to Córdoba by way of the natural pass of Despeñaperros. Visit the impressive Mosque/ Cathedral and stroll through the narrow streets of the Jewish quarter. In the afternoon, the trip continues to Sevilla. Arrival, dinner, and accommodation at the hotel. Breakfast at the hotel. In the morning, a tour of the city’s monuments and most scenic sites: the exterior of the Cathedral, the second largest Catholic cathedral after Saint Peter’s in Rome; the Barrio de Santa Cruz, the natural setting of Carmen and Don Juan; Maria Luisa Park and the Plaza de España. Afternoon free to discover the different perspectives and flavours of this magical city. Dinner and accommodation at the hotel. Optional flamenco show. Breakfast at the hotel and route through the White Towns of Andalucía heading towards Ronda. Free time to admire this city of Celtic origin with marvellous views of the valley and mountain. In the afternoon, the journey to the modern and exceptional international tourist destination of Costa del Sol. Dinner and accommodation at the hotel. After breakfast at the hotel, departure along the Costa del Sol through locations like Marbella and Puerto Banus. Arrival at Algeciras or Tarifa. A short ferry journey across the Strait of Gibraltar. Arrival in Morocco, disembarkation, customs processes and continuation of a trip by coach via Larache to Fez, the most monumental of the Imperial Cities. Its University of Al Karaouin is the largest Islamic sanctuary in Morocco with ancient theological schools, and more. Dinner and accommodation at the hotel. Breakfast at the hotel. In the morning, a tour of the 7 gates of the Royal Palace, Jewish quarter or Mellah, Bab Bou Jeloud gate, and a stroll through the grandiose medina, or historic quarter, declared a World Heritage Site. Afternoon free. Dinner and accommodation at the hotel. Optional dinner and show. Breakfast at the hotel. Departure to the historic quarter of Meknes, surrounded by 40 km of city walls. A sightseeing tour to see the Bab Al Mansour gate, the most beautiful gate in Morocco and the city’s most iconic landmark. The trip goes on to Marrakesh, the capital of the south located in the oasis between the Atlas Mountains and the pre-desert area. Dinner and accommodation at the hotel. Breakfast at the hotel. Tour including the Koutoubia Tower, the twin of La Giralda in Sevilla, the Saadianas Tombs and Bahia Palace. In the afternoon, a stroll through the medina, bazaars, and the magical Jemaa el-Fna market, complete with fortune tellers, snake charmers, acrobats, etc. – a unique open-air setting for taking unforgettable photos. Return to hotel and free time. Dinner and accommodation at the hotel. Optional dinner and show “Fantasia Chez Ali”. After breakfast at the hotel, departure towards the north via Benguir and Settat to Casablanca, a city of commerce and industry and with the largest population in the country. Tour of the city’s most interesting highlights: Anfa Boulevard, United Nations Square, residential areas and an exterior visit to the Hassan II Mosque. In the afternoon, departure to Rabat, the diplomatic and governmental capital, and home of King Mohammed VI. Dinner and accommodation at the hotel. Breakfast at the hotel. Exterior tour of the Royal Palace, the Mausoleum of Mohamed V, and the Hassan Tower (important examples of Almohad architecture). In the afternoon, the trip continues via Larache to the major cosmopolitan city of Tangier for a short sightseeing tour. Free time. Dinner and accommodation at the hotel. Breakfast at the hotel. Transfer to the port to board the ferry to Spain. Journey to the hotel on the Costa del Sol. Dinner and accommodation at the hotel. Breakfast at the hotel. Departure to Granada and its incredible collection of monuments, the last bastion of Granada’s Nasrid Dynasty until 1492. Visit the famous Alhambra complex and the Generalife Gardens. This is a setting which inspired authors such as W. Irving in his work Tales of the Alhambra. The remainder of the afternoon free. Dinner and accommodation at the hotel. Optional Zambra flamenco show in the Sacromonte neighbourhood. Breakfast at the hotel. Departure to Toledo, the impressive imperial city surrounded by the Tajo River, declared a World Heritage Site and the cradle of Christian, Muslim and Jewish civilizations. A marvel of art, history and spirituality, this city is a national monument. A tour including its major monuments, its typical narrow streets and examples of the damascening technique (inlaying precious metals in steel). The trip continues to Madrid. End of services.